The 5.1 holidays just ended, there is no reservations at all. We had dinner and were ready to rest. All of a sudden came two guests, carrying radio intercom. When they arrived, they immediately ask the rest of the group to come down. This was a group of seven people coming from Guangdong and Hong Kong. They asked for dinner, and would like to order a whole chicken but we could not do it so late at night. The way they ordered was pretty much like what you see on Chinese wuxia movies: “hey waiter, get me the best food and wine you have…” of course, it is the same, but feels pretty much that way. Anyway, we almost cooked everything we have in the kitchen and they finished them all in a flash. They asked for eight fried eggs sunny side up, and ate them with soy sauce and still wanted more, but we said no… and then they ordered for the next night, a whole chicken, a whole duck and many other dishes. Oh, tomorrow is gonna be a busy day in the kitchen!! After dinner, we chat with the guests. 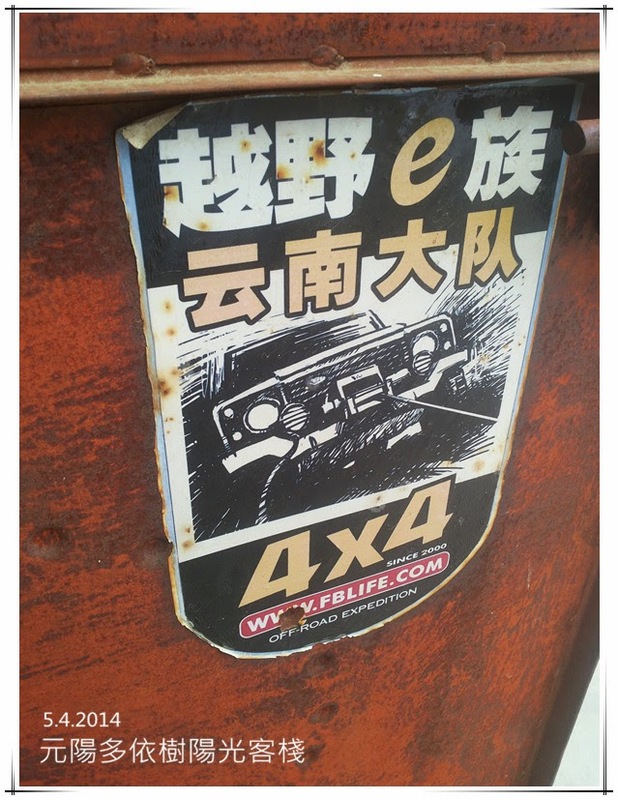 We found that they are members of FBLIFE.COM which is an international platform for lovers of 4x4 SUVs, most of them are of course drivers of SUVs. 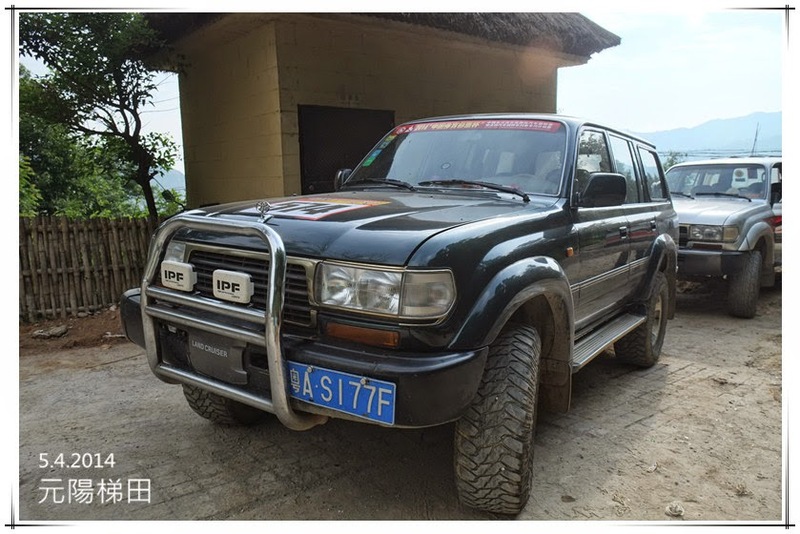 This is a huge platform which connects a large number of SUV lovers around the world and they organize trips and drive their fleets of SUVs everywhere. They have a huge network, and since the auntie Hu’s son is a member of FBLIFE.COM, when any of their members come to YuanYang, they will stay at the Sunny Guesthouse for sure. 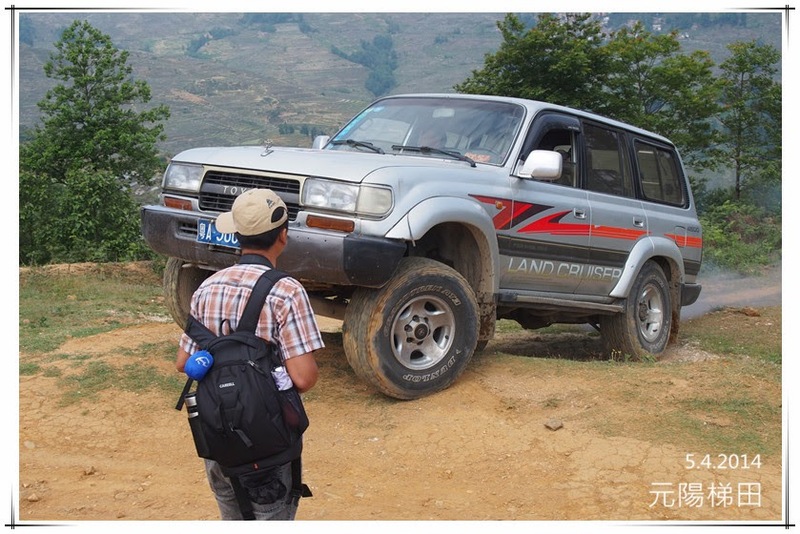 This group of seven people came from the HK and Panyu teams, they drove two Land Cruisers. People who knows me well would know that I love huge SUVs, I am so excited to see their cars!! The next morning, we again play local guides and take them to HaDanPu, let’s go!! Let me explain in a bit more details. Rice terraces are basically located in the valleys on very high altitude, and are built on the hills. The best viewing place are places which sticks out from the hills where you can see a full view of the surrounding rice terraces. HaDanPu is one of those, you have to stop your car on the main road, and walk about 20 min through a village to arrive at the viewing location. 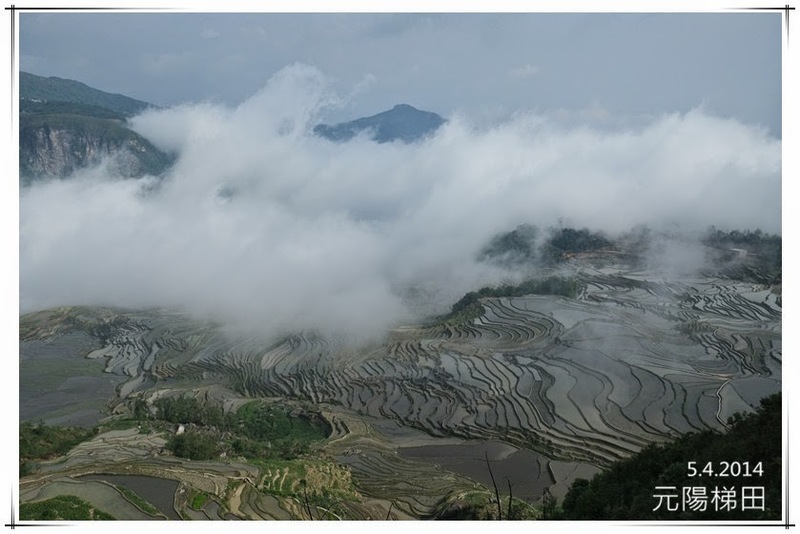 The rice terraces you see is still part of the DuoYiShu rice terraces but you see it from a different angle and you see the sea of clouds beneath you. The clouds are blown from the valley below and hang up above the rice terraces. Usually when you finish with HaDanPu, you walk back up to the main road and continue with the car. However, the FBLIFE people do not see the roads the same way as regular people. As long as it is wide enough, no matter if there is a road, no matter how steep the slope is, they can still drive through on their SUVs… so, we quickly come to consensus. Two drivers would go back to drive the SUVs while the rest of the group walk to a nearby village. We can see that village from here, and can see a “road” that the SUVs can reach. However, we have no idea where the road starts, this will need the drivers to search and judge. We risk that if the SUVs cannot find us, we will have to walk back up. However, I have full confidence in them. If it was just the two of us, we would not have done this. We are so happy to be able to explore a new place in a different way! This is so amazing, we walked for 30 min and easily reached the designated village. 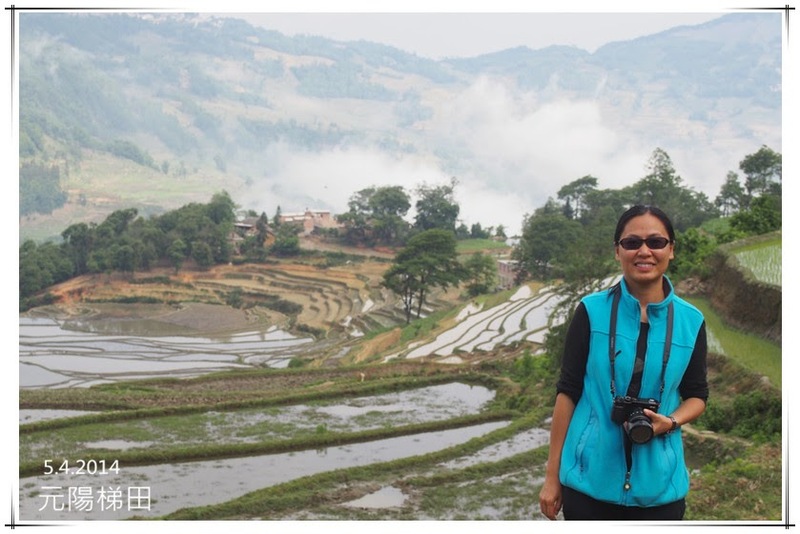 Moreover, we get to see beautiful views of the rice terraces along the way. Although we had no clue where we were, we already saw the Land Cruisers coming our way on the winding and bumpy road above us! We waited not too long, and the SUVs arrived. They don’t need to consider where to turn around, because they can turn around just on the slope besides where we stand. We saw some minivans on the way, they can only move slowly and carefully on that road, and almost want us to toll them back up… I really find today’s trip so amazing!! If we were to walk back up, it will take more than an hour of tough walking!! And finally, I realized that we ended up in DaWaJie. This group of seven SUV racers just left and there come another two.